Family Formation is a family-based catechetical program that helps families grow in the transforming love of God by understanding and living the Catholic Faith. parishes and families with children in preschool through Grade 6. 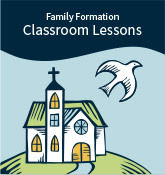 Family Formation’s unique catechesis model helps children and parents to become stronger in faith together. Equipping parents to be educators. Family Formation is a tried and true model and curriculum developed by parents who were searching for a better way to convey and pass on the Truths of the Faith to their children. Announcing 2019-2020 price changes and initiatives! We have had such positive response from our families about the Family Formation program that I am sharing it with other parishes in our area. The teacher presentations are clear, simple, and complete. Thank you for making this available for other parishes! Eight monthly classroom lessons and activities. Two levels to choose from: Grades K-3 and 4-6. 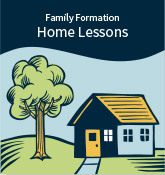 Weekly lessons for a family with children in Grades K-6. Easy-to-use lessons for child and parent to complete together to prepare for First Reconciliation. Easy-to-use lessons for child and parent to complete together to prepare for First Communion. Easy-to-use lessons for child and parent to complete together to prepare for First Reconciliation. First Communion Booklet also available. Follow the Pauline family as they prepare for the Sunday Gospel in a fun, creative, and often dramatic way. One book for each liturgical cycle. 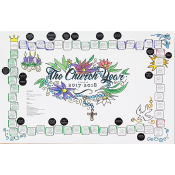 Follow the rhythm of the Church year by using this tool to identify the current liturgical season.